This beautiful compilation combines prayerful texts with moving melodies, perfect for any occasion which references the Virgin Mary. The CD contains a beautiful compilation of prayerful texts with moving melodies, perfect for any occasion which references the Virgin Mary. 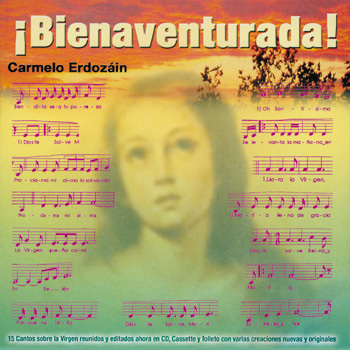 This is the songbook for Bienaventurada. Find the rich orchestration and pleasing arrangements for Marian devotions. The lyrical poetry of the texts is matched by the classical style of the music. This beautiful compilation, created specifically for liturgical ministers and for home Marian devotions, combines prayerful texts with moving melodies. The resulting effect is profoundly meaningful. These recognizable worship songs, many based on ancient canticles and on texts composed by Erdozáin himself, are perfect for any occasion which references the Virgin Mary. Everything is included, from the serene “Hail Mary” to the pretty “Porque Mi Niño No Tiene Nada” to the entire "Magnificat" set to music. Rich orchestration and pleasing arrangements play against fascinating choral textures to create a sense of mystery and reverence. The lyrical poetry of the texts is matched by the classical style of the music. With over 25 collections to his credit, Father Carmelo Erdozáin is one of the most prolific composers in the Hispanic world. This lovely set of Marian songs is a fine addition to his body of work.